You are here: Home / Raw Islam / Raw Islam 44: Greed is the Root of All Evil, But is it The Key to Stopping School Shootings? Raw Islam 44: Greed is the Root of All Evil, But is it The Key to Stopping School Shootings? 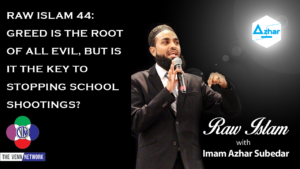 This week on the Raw Islam Podcast with Imam Azhar– a 2017 Podcast Award nominated podcast, our question of the week is greed the root of all evil? And how is that related to the Parkland shooting? While B.C. Dodge opens the show on a positive note, and Imam Azhar agrees that on this podcast we try our best to stay and keep positive, there is no ignoring the fact that there was yet another school shooting – this time in Parkland, Florida. Imam Azhar reminds us of a hadith that tells us to be wary of this life, and the things in this life. We need to remember to prepare for the here-after, and not get caught up in the pleasures of this life. Part of getting caught up in this life is avoiding greed. He then recounts a story of a Muslim brother that went on a business trip and had lavish gifts given to him, including women being sent to his hotel room. He knew this was not the way to do business and it is proof that this world can be used against us, and that money is a motivator – which is part of being greedy. Imam Azhar brings it all back around to the simple point that with the money that the NRA is spending, and the willingness of people to take that money – are prayers and thoughts enough when these tragedies happen?